I am a fully qualified and respected healthcare professional, with over 30 years of experience. I have worked for 12 years in the NHS as a staff nurse and Ward Sister and have been a complementary therapist since 1995. As well as running a busy private practice I have experience of working at our local hospice, co-founding and managing Bury Cancer Support centre for three years and working as deputy clinical lead for complementary therapies at a major cancer hospital.I have also recently worked as keyworker and therapist at Bury cancer support centre as well as setting up and co-ordinating Bury Breast Cancer Support Group. I trained as a Medical Herbalist at Central Lancashire University, gaining a first class BSc (Hons) degree and becoming a member of the National Institute of Medical Herbalists (NIMH), which is one of the country’s leading professional bodies in Herbal Medicine . I am a consulting Medical Herbalist, practicing in Bury Lancashire as well as leading “Wild Medicine Walks” in my locality. 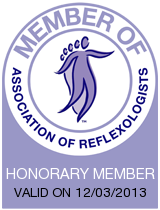 I am also a Life Honorary Member of the Association of Reflexologists and have practised and lectured internationally in Reflexology for many years. I have co written chapters on “Reflexology in Cancer care” in “Clinical Reflexology” edited by Mackereth & Tiran and in “Massage and Bodywork; Adapting therapies for Cancer Care” edited by Mackereth & Carter. I recently qualified as a GAPS Practitoner having trained with Dr Natasha Campbell-McBride. I have two teenage children and two cats, I am interested in all things green and growing, I enjoy walking, foraging, cooking and just being outdoors. I am also part of the “Herbal Collective Roots” a Herbal cooperative running projects to make working with Herbs accessible to all.